The NC87 Leadership Program chose the Ronald McDonald House in Durham for their project. They completely redesigned the playroom, including new flooring, a “castle” for children to play in, and toys and books. Budget: $18,000. The NC149 Leadership created a beautiful garden with over 100 plants and a walkway to allow families to feel at peace and full of life. They planted butterfly-attracting plants, a walkway, a water feature with soothing sounds of water, and seating that provided seating to encourage a space of relaxation and peace. A beautiful gazebo and two sheds were repaired. In addition, the team installed “DaVinci” artwork frames in ten bedrooms to encourage children to creatively and artistically express their Journey through art. WorldLegacy Extreme Makeover Ronald McDonald House Ronald McDonald House in Durham NC will be getting an extreme makeover by WorldLegacy’s NC149 leadership team. In only two days, the team will create a Serenity Garden and other upgrades for children and families to experience love, beauty and peace. Children are our most valuable resource.’- Herbert Hoover Durham, NC (PRWEB) August 20, 2014 Ronald McDonald House will receive a powerful transformation of their facility on the weekend of August 22 – 24. Members of the NC149 Leadership Team from the WorldLegacy in Chapel Hill, NC are creating an extreme makeover of the Ronald McDonald House because they have a vision of uniting the world with love and empowerment. This extreme makeover project is the culmination of WorldLegacy’s three-month leadership development program. NC149 is committed to creating a safe and beautiful space for families to come together and feel loved and supported as they are going through challenging times. They want families to experience abundant love and connection to each other and the world around them. Their intention is to create a space of peace, reflection and calm in the storm of life’s challenges. The WorldLegacy Leadership Program is a three-month program designed to develop skills in leadership, enrollment and contribution. What makes this project unique is that the WorldLegacy Leadership team of four individuals must completely design the project from start to finish, cannot use any of their own money, must involve the community to do 75% of the work and also have it complete in one weekend! Every leadership team of the WorldLegacy creates a project that focuses on a domain such as family, children, health, community, animals, agriculture or the world. The NC149 team chose a project in the domain of children. They selected The Ronald McDonald House because it supports families with children who face immense emotional, physical and financial challenges. Knowing that the Ronald McDonald House of Durham will be there to support them in a safe and caring environment helps to alleviate some these challenges. Built with love, the Ronald McDonald House of Durham offers a comforting home away from home and a community of support for seriously ill children and their families. The NC149 Leadership Team will create a beautiful garden with over 100 plants and a walkway to allow families to feel at peace and full of life. They will plant butterfly-attracting plants, create a walkway, install a water feature with soothing sounds of water and provide seating to encourage a space of relaxation and peace. They will repair and beautify a gazebo and two sheds. In addition, the NC149 Leadership team will install “DaVinci” artwork frames in ten bedrooms to encourage children to creatively and artistically express their Journey through art. The NC 149 Leadership Team asks for your help to make this life-changing project possible the weekend starting at 12:00 pm Friday, August 22, 2014 and concluding with the ribbon cutting at 5:00 pm on Sunday, August 24, 2014. The team will begin the work at 12 pm on Friday and then 8 am on both Saturday and Sunday at 506 Alexander Ave, Durham, NC 27705. Everyone is invited to come out and be a part of creating something magical for these children and their families. 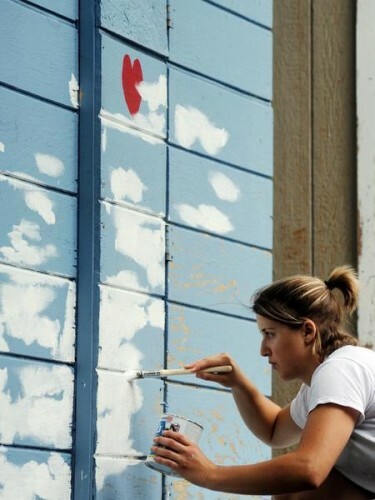 Liz Anderson of Chapel Hill paints clouds on a shed at the Ronald McDonald House of Durham on Sunday, August 24, 2014. Members of the NC149 Leadership Team from the WorldLegacy and other volunteers spent the weekend creating a serenity garden, painting a gazebo and sheds. Jacqueline Thomas had two weeks to raise money to build a Serenity Garden at the Ronald McDonald House in Durham. She also had to have the community complete 75 percent of the work and finish the garden in one weekend. Thomas, a resident of Durham, is part of the WorldLegacy Leadership’s NC149 program, which completed building a Serenity Garden and other upgrades to the Ronald McDonald House throughout the weekend at an estimated cost of $25,000. Enrollees in the three-month program must completely design a program from start to finish that will leave a lasting impact in the community and cannot raise money to complete the project until two weeks before the project’s construction begins, Randall said. She said donations have been coming from all over to complete the garden, from Maryland down to South Carolina. Toward the end of construction Sunday, Thomas gathered around with members of the WorldLegacy and Ronald McDonald House, all of whom began crying and hugging. “When I came in to the (Ronald McDonald House,) I felt the love, the warmth,” Thomas said. “(And) the openness and healing that this house brings to these families.” Some 30 volunteers began construction for the garden on Friday around noon and worked late into the night Friday and Saturday, said Nancy Jones, director of development at communications at the Ronald McDonald House. The house, which has provided meals, housing and entertainment to families of seriously ill children for 34 years, expanded two years ago from 29 to 55 bedrooms, Jones said. About a year ago, volunteers at the house developed a vision for a garden at the house and Jones said the WorldLegacy has made that vision a reality. “(This) was really just access to a parking lot,” Jones said, pointing at the space of the Serenity Garden, which now houses a variety of ferns and other plants, a two-story sculpture donated by artist Guy Solie and a structure with flowing water. The newly constructed garden continues around the front of the house with more plants, a renovated gazebo and a walkway. “It’s really going to enhance the experience of the children and families staying here,” Jones said. Randall said the projects’ guidelines are intended to put pressure on the program’s enrollees and can sometimes cause skepticism in terms of the time frame to complete projects.